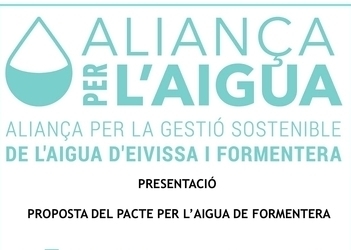 The Formentera Council's office of environment reports that tomorrow, Tuesday February 26 at 7.00pm in the hall of ceremonies, Eivissa and Formentera's Aliança per l'Aigua (Alliance for Water) will oversee a presentation of the local “Water Pact”. The four basic objectives underlying the measures of the Pacte per l'Aigua are quality guarantees on water supply and drought risk prevention; appropriate waste water purification; repurposing of purification plant water and mud for agricultural, urban and environmental use; and lastly, recovery from local aquifers and water ecosystems. Environment councillor Daisee Aguilera encouraged islanders to come to the open info session to contribute to the strategic plan for managing “a resource that is not only key in socioeconomic terms, but also from an environmental standpoint”. The idea of the pact is to promote the engagement of local groups to drive and develop basic measures to improve the current water situation in the immediate future. Alliance for Water sees water as a crucial issue for the economic development and environmental sustainability of the island. The Formentera Council's environment office reports that two local groups—Formentera Sense Plàstics (“Plastic-free Formentera”) and Gen-Gob Eivissa, a nature and ornithology organisation—have put together a microplastics workshop for Saturday February 16 at 10.00am on es Cavall d'en Borràs beach. The day is geared to adults and children from Formentera and Eivissa. 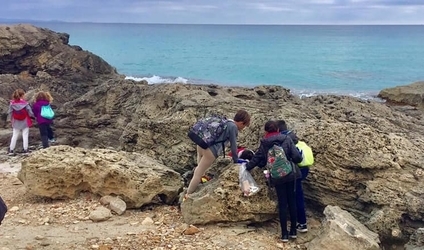 Participants in Plastic Zero, a programme sponsored by the Formentera Council and Gen-Gob and designed to get schools on board with an initiative known as the “Sea Observers Protocol”, collect scientific data about the quantity and kind of plastics turning up on local shores. Data are sent to the “Sea Observers” national office to help paint a clearer picture the shape Spain's seas are in. Saturday's workshop will also be the chance for parents to find out about children are already doing on the subject in the classroom. The Formentera Council's environment office reports that last year 29 per cent of the rubbish which turned up at es Cap de Barbaria's waste treatment plant was recycled, equivalent to a 5.2 per cent year-on-year increase (in 2017 the figure was 23.7 per cent). That was the message CiF environment councillor Daisee Aguilera drove home today during an 11.00am press conference in the Sala d'Actes. Aguilera described the uptick as gradual—islanders recycled 22.8 per cent of their waste in 2016—and pinned it on an upgraded municipal collection, unflagging investment in green education and the efforts of the island's medium- and large-scale waste generators. Among the upgrades Aguilera alluded to is door-to-door collection of organic waste at 140 local businesses. The establishments accounted for 527.4 tonnes of organic waste during the central months of summer 2018—five per cent of the recycled total. The councillor called the service's roll-out “a key part of the increase” and thanked businesses for pitching in. Aguilera expressed hope that 2019, the service's second year, would see continued progress. Councillor Aguilera also underscored a 15.2-per-cent spike in plastics collection between 2017 and 2018. She interpreted the change as fruit of “door-to-door pick-up at businesses in the nature preserve, free-of-charge wheeled bins for local businesses and an equipment upgrade funded by Ecoembes that makes it easier—particularly for employees at restaurants and supermarkets—to empty yellow bins”. Department specialist Javier Asensio highlighted the recycling outreach being done at island schools—for instance the Be Blue/Trasmapi-backed trial roll-out of plastics-collection machines. From September to December that push netted sixteen thousand recycled plastics. Glass waste is still the most frequently recycled and represents the heaviest of what is picked up. Of all the solid waste shipped to Formentera's transfer station from urban areas, glass made up for 9.4 per cent (997.4 tonnes) while paper and cardboard came in at 9 per cent (955.35). This figure is in large part due to door-to-door pick-up at businesses considered large-scale generators of waste. Recycling of large objects has grown year after year as well—13 per cent since 2017 and 74 per cent since 2015. The category includes furniture, mattresses, pallets, old boats and other plus-size discarded objects. Such objects are either taken to the processing point, the Deixalleria, by the municipal home collection service for furniture and home appliances (telephone 900 102 65), or individual islanders or businesses can drop such material off directly at the es Cap de Barbaria transfer station. 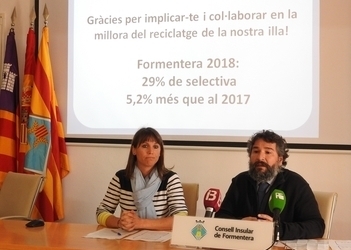 Aguilera expressed her satisfaction at the reduction of waste heading for landfills since 2017—the total shrank by 8.6 per cent in one year—a change which meant savings of €95,042. The councillor said that normal and oversize rubbish at Ca Na Putxa tip on Eivissa weighed 7,510 tonnes and cost the Council €1.3 million in 2018. The administration pays €141 per tonne to ship such waste, and another €31/tonne to process it at the tip, or €172 total. Waste pick-up and the Deixalleria's operating costs must also be factored in, which in one year accounts for nearly €1.6 million. Aguilera pointed up the returns stemming from material pick-up for integrated management systems. The administration got €161,364 for the plastics, paper and cardboard received by Ecoembes and €49,714 for glass that went to Ecovidrio, putting total returns in 2018 at €211,078, a sum that can be invested back into pick-up of recyclable glass, paper and plastics. The councillor thanked islanders for their efforts, and highlighted the financial—“and especially environmental”—benefits to recycling. 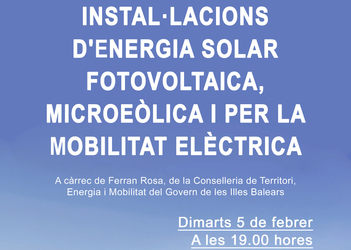 The Formentera Council environment department reports that tomorrow, Tuesday February 5 at 7.00pm in the hall of ceremonies of the administration, the Sala d'Actes, where Balearic director general of energy Ferran Rosa will outline the new run of help for solar, photovoltaic and small-scale wind turbine technologies and e-mobility. Environment councillor Daisee Aguilera will be on hand too, doubling down on the “local renewable energies push”. She speaks about the need to “reduce energy consumption across the power grid and with private generators and cut CO2 emissions”. Aguilera is encouraging people from the local business community and islanders off all stripes to come out. “Assistance is available for people installing clean energies at home”, she said, “or purchasing an increasingly competitive vehicle”. Another round of assistance exists to set up private-use charging stations. Originally scheduled for Thursday January 24, the chat was suspended due to troubles in ferry connections prevented Rosa's arrival on the island. Thursday January 24 the Govern's director general of energy, Ferran Rosa, together with CiF environment councillor Daisee Aguilera, will talk about the newest round of assistance for everything from solar, photovoltaic and small-scale wind turbine technologies through to electric mobility. Geared towards islanders and specialised businesses alike, the gathering is scheduled to take place at 7.30pm in the conference space of the island's dependent care facility (Centre de Dia). The initiative is aimed at promoting clean energy and “self-consumption” (when the person or entity using the energy is the same one that produced it) and is coordinated by the Govern balear's directorate general of energy and climate change, an offshoot of the regional ministry of land, energy and mobility. Councillor Aguilera said islanders who come to Thursday's session will “know how to benefit from funding to keep promoting renewable energies on the island”. She highlighted an array of funding options, including money so private businesses can install charging stations to further sustainable mobility. A total of €1.8 million in funding is available for the four islands of the archipelago, a portion of which is put up by the European Regional Development Fund (ERDF). Applicants are eligible for reimbursement of 40 to 50 per cent (applications must be received by March 29 and work must be complete by September 20, 2019). a) Small and medium-sized businesses. b) Non-profit organisations and business associations which operate and are headquartered in the Balearic Islands. c) Individual homeowners and homeowners' associations who oversee installations in dwellings or other facilities in the Balearic Islands. a) Businesses, business associations and non-profit associations can receive 40 per cent back on installations of photovoltaic- and small-scale wind turbine-based technology. b) Individual homeowners and homeowners' associations can receive 50 per cent back on installations of photovoltaic- and small-scale wind turbine-based technology. c) Fifty per cent reimbursement for installation of photovoltaic or small-scale wind turbine equipment that incorporate lithium-ion systems.